When you’re trying to expand the ranks of tax resisters in your campaign, you need good educational tools. People are often reluctant to resist either because they aren’t sure how to go about it, or because they only have a vague idea of the likely consequences (and so are likely to exaggerate their frightfulness). People like to stick with the familiar, and if you ask them to take a jump into the unknown, they will imagine the worst as a way to justify their reticence. If you can be clear, thorough, and credible in demonstrating how to resist and what the consequences are likely to be, you can eliminate the biggest obstacle to the growth of your campaign. This is easier said than done, however. It can be difficult to be clear and thorough if you are going up against a tax agency that is arbitrary or that changes its rules suddenly, and it can take time to establish credibility. Today I’ll give a few examples of how tax resistance campaigns have dispelled ignorance about tax resistance. Many married women, including leading actresses, doctors, titled women, business women, and various others having property, businesses, investments, &c., or being in receipt of salaries, have succeeded in demonstrating their non-taxability, and thereby involved the Revenue in a total loss of the tax illegally charged on them. Members of the Women’s Tax Resistance League regularly gave lectures on their tactic of choice at suffragist meetings, and thereby recruited new resisters. The American war tax resistance group NWTRCC publishes a number of specialized how-to pamphlets that cover various techniques of tax resistance (such as refusing to file, filing and refusing to pay, living on a non-taxable income) and strategies for coping with possible consequences (such as government collection efforts). They also have a nationwide network of people who offer one-on-one counseling sessions for potential resisters or for current resisters who are running into snags. Local groups in the network periodically run workshops at which people can come to learn about the variety of war tax resistance methods and ask questions of people who have experience with them. The current tax resistance movement in Spain, which has its roots in the war tax resistance movement there but which has expanded to a broader anti-government pro-autonomy critique, recently published half a million copies of a tabloid that included its call to resist alongside some practical instruction on how to go about resisting both the pay-as-you-earn income tax and the value-added tax. 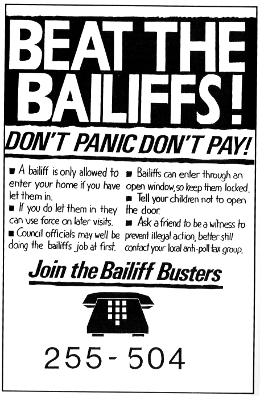 [T]he first task of Anti-Poll Tax Unions was to inform people about what the bailiffs could and couldn’t do. In Scotland, people were advised not to tell the sheriffs where they worked, not to tell them which banks they used, and not, under any circumstances, to let them into their houses. They were also told to inform the local group as soon as the sheriffs threatened anything. The Anti-Poll Tax Unions advised people to move possessions to local friends’ houses before the date of the poinding and offered to help with the moving. People were told to leave their cars well away from their homes. They were informed that a wrongful poinding could be appealed against and, in many cases, this was done successfully. People were also told how to avoid bailiff action by signing away their possessions to people who lived outside of the area or, preferably, to their children. There are now young children who technically own all of their parents’ possessions. Today bailiffs have delivered notices for payment to over 4,000 people in Bristol. A spokesperson from the law centre said that they were illegal and should be ignored. So most people ignored them. A campaign like this could not be carried on without a publicity department. The peasants could not be asked to subscribe to daily papers or even to the weekly Navajivan , and outside papers could at best give an outside view of the campaign. A publicity office was therefore opened with Sjt. Jugatram Dave at its head. With an artist’s pen and with a knowledge of the whole taluka [district] at his fingertips, he took to this work like a duck to water. The arrangement was to issue a daily news bulletin and publish Sjt. Vallabhbhai’s speeches in pamphlet form and to distribute them free to the agriculturists all over the taluka: For four or five days cyclostyled [mimeograph-like] copies were issued, but arrangement was soon made to get them printed daily at Surat, and a start was made with 5,000 copies. The arrangement answered most admirably, the villagers waiting anxiously for the patrikas every morning and devouring the contents with avidity. All the Gujarati and almost all the English dailies of Bombay reproduced them verbatim, and as the movement gathered force, every important town and village in Gujarat began to get copies of the bulletin with the result that over and above ten thousand copies distributed in Bardoli, four thousand copies were subscribed to by places outside. Surveying people who used to be war tax resisters: why did they stop? would they be willing to start up again if they were among thousands of others engaging in an anti-war tax strike? 286 war tax resisters are surveyed about their attitudes and their demographics. Meet your typical war tax resister: she’s middle-aged, white, single, childless, non-Christian, with a graduate degree, has been resisting for over a decade, and redirects the money she would have given to the I.R.S. to a charitable cause. A conservative student journalist files a report on a Northern California War Tax Resistance workshop. Also: there are a lot of “people power” movements making change in the world today, so why does the mainstream media only seem to report on the ones whose goals coincide with U.S. foreign policy ambitions? Some updated statistics on how many people aren’t paying their taxes and what the I.R.S. is doing about it. Also: you’re invited to free introductory workshops on war tax resistance this weekend in San Francisco. A “99 Tactics” teach-in is coming up in San Diego — one of the “Days of War Tax Action 2016” events. Also: some war tax resistance artifacts, Steve Russell on creative war tax resistance tactics, and a passive resistance league formed in St. Ives. The I.R.S. headquarters in Washington was flooded in recent storms. They are closing shop for at least a month while they sort out the millions of dollars of damages, including the destruction of 95% of the building’s electrical and computer equipment. Also: NWTRCC publishes a new pamphlet designed to help older tax resisters. A 2011 update supplement to the 2003 book on War Tax Resistance is available for free on-line. Also: on this date in 1862, Quakers from the confederacy met under the cloud of military conscription and militia exemption taxes. Half a million copies of a radical tabloid called ¡Rebelaos! (“Revolt!”) have hit the streets across Spain, promoting mass tax resistance and redirection in the service of local self-government. Some tax resistance “memes” to add to your arsenal when you wade out into the propaganda wars on social media. Thatcher’s poll tax was very unpopular in Scotland, where organizers of the resistance against the tax planned to disrupt the government’s collection efforts by refusing to register in a straightforward way but instead returning their registration forms with a legal request for additional information. In the midst of the Poll Tax rebellion in Britain, “Third Way” magazine looked back at the tax revolt of English nonconformists nearly a century before. Thatcher’s “poll tax” was a complete disaster… but the conservatives thought it was a splendid idea at the time, and that the protests against it weren’t going to amount to anything. On this day in 1932, the papers reported the arrest of Mohandas Gandhi’s wife, Kasturbhai, for inciting Indians to refuse to pay their taxes. While stimulus-critics on this side of the Atlantic are content to throw tea parties and hint at drastic action on television talk shows, in Spain they’re putting their money where their mouths are, in the first tax resistance campaign anywhere (that I know of) that has an explicitly environmentalist focus. Ricardo Rodríguez of Rebelión critiques left-wing Spanish tax resistance from the left. The debate continues: Ricardo Rodríguez responds to Pablo San José’s rejoinder to Rodríguez’s critique of tax resistance, in Rebelión. More news from the contemporary tax resistance movement in Spain. A video explains the emerging Spanish tax resistance movement. Also: war tax resistance among Italian Catholics. And: Artwork commemorating the Ipswich, Massachusetts tax rebellion in 1687. Also: celibate Catholics vow to defy a bachelor tax in Australia in 1917. Some international tax resistance news, with notes from Ukraine, Spain, England, Brazil, and France. An international tax resistance round-up, with news from Sweden, Austria, Spain, and Italy. Also: Syracuse University students resisted a collective-punishment tax in 1902. An early mention of the “Hang Up On War” campaign from the Liberation News Service, and a precedent for the “comprehensive disobedience” idea from an old issue of Liberation magazine. The Women’s Tax Resistance League produced a series of posters to propagandize their cause. They also came out in force at the unveiling of a new statue of John Hampden at Aylesbury. Kate Harvey gets some inspiring verse while under siege, Mark Wilks faces arrest for failing to pay his wife’s taxes, and Marie Lawson petitions His Majesty the King. Another week in the British women’s suffrage movement. The government throws in the towel and without explanation releases Mark Wilks, who had been imprisoned for refusing to pay his wife’s taxes, in 1912. Also: Ethel Ayres Purdie on the plight of women whose incomes were legally the property of their husbands. From the 15 October 1910 issue of “The Vote” come these reports of speeches given at a mass suffrage meeting in Trafalgar Square. They say Mussolini made the trains run on time, and the chairman of the League of Nations’ Permanent Mandates Commission thought he could also teach New Zealand a thing or two about forcing the Samoan natives to pay their taxes to their occupiers. Also: the Women’s Tax Resistance League gets up a head of steam in 1910. Part two of Ethel Ayers Purdie’s “Red Tape Comedy” about her victory against Inland Revenue in 1912. Ethel Ayers Purdie was an invaluable tax law expert for the women’s suffrage movement in England. When she hung out a shingle reading “Women Tax-Payers’ Agency” her landlords and fellow-tenants ran her out of the building… so she relocated to the Hampden house, named after famous English tax resister John Hampden. “We are not so much concerned about the pecuniary loss or sufferings likely to be sustained by our Society from this law, as we are that all our members should stand firm, and be faithful in bearing their testimony against war and military operations; taxes and fines appertaining thereunto, either directly or indirectly,” wrote the North Carolina Yearly Meeting in 1831. Also: suffragettes successfully convince an auction crowd not to bid on a wagon seized from a resister. And: in 1982, Ralph Dull tries to pay his tax bill in corn.